Even though skin cancer occurs in adults, the serious skin cancers are caused by the radiation damage (particularly the sunburns) that occurred in our youth. Children are at the highest risk for sun damage, and more than half of a lifetime’s sun exposure usually happens during childhood. Try to avoid the sun’s most intense rays by staying out of the sun during the middle of the day — and don’t be lulled into complacency by overcast days, since most of the sun’s harmful rays will get through the clouds. Keep babies younger than 6 months out of direct sunlight. Shade can be found under a tree, umbrella, or the stroller. Be especially careful if you are around water, sand, snow, or any surface that will reflect and therefore intensify the sun’s rays. Remember, the sun’s rays are more intense the higher you get in elevation. When purchasing sunscreen, select a PABA-free brand with an SPF of at least 15, preferably greater. Choose a sunscreen that says “broad-spectrum” on the label – this means it will provide protection against both UVA and UVB rays. In general, infants’ skin is much thinner and more sensitive to the sun than adults’ skin, even in individuals with darker complexions. 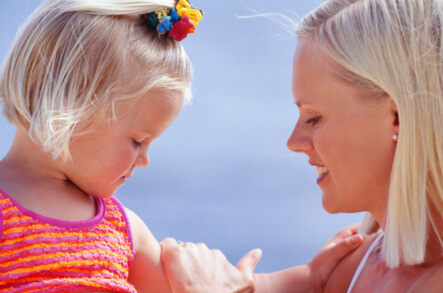 The amount of sunscreen needed depends on how light the child’s complexion is. I would recommend using sunscreen with an SPF of at least 30 for very fair-skinned children. The AAP used to recommend not putting sunscreen on infants under six months of age. This is no longer the case, because the danger from sunburns outweighs the risk of sensitivity to sunscreens. For babies younger than 6 monhts, use sunscreen on small areas of the body, such as the face and the backs of the hands. Sunscreen is most effective if first applied 20-30 minutes before sun exposure. Use sunscreen whenever you expect to be in the sun for thirty minutes or more, and re-apply after swimming. Even waterproof sunscreens should be re-applied every 80 minutes or so, after being in the water. Make effective use of clothing, hats, and other physical barriers to protect the skin from the sun.